This calendar represents group and event schedules for the MC only. THIS IS NOT THE EVENTS CALENDAR. TIMES LISTED HERE WILL ALSO INCLUDE SETUP TIMES IN SOME CASES. This also does not include building occupation by staff and volunteers which may include occupation at any hour of a day, any day of the week. This schedule indicates the area listed will be in use by the group listed, at the specified time, whether it be event setup, the actual event or tear down time. The times listed are the actual times an area is reserved and cannot be utilized for other purposes. 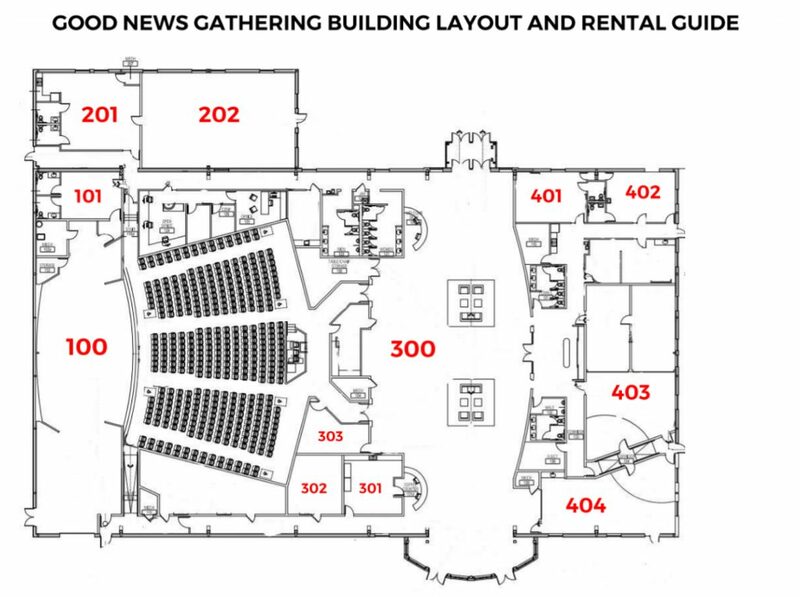 The rooms identified in the drawing above are the rooms that are available for rental and event use. The following legend gives you information regarding the room amenities. The stated occupant numbers are suggested maximums. Seats over 400 in movie-theater chairs. TV with DVD Player available. Refrigerator storage limited, but available. TV Cart with DVD Player available. Tables/Chairs available for over 200. Numerous seating options (couches, chairs, café tables/chairs, etc). Natural light via large windows on North and south sides of atrium. Chairs and tables can be made available. Large or Small group meeting spaces within this room are available (large space can be cut into three smaller sections by lowering garage doors. Chairs and tables for children are currently in the room. Chairs and tables for adults can be made available.